Extend your shop management system into your driveway and your bays with Mobile ManagerPro. 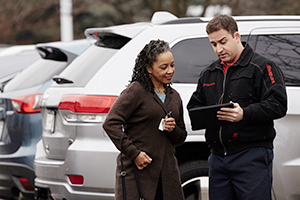 Using a pre-configured tablet device, you can start multi-point inspections, estimates and repair orders right at the vehicle – or anywhere. You will save time through VIN and license plate decoding and canned tech notes, among other features. No need to handwrite estimates — just take the tablet to the vehicle and enter in the information. Go Mobile and Expand the Way You Do Business. Go Paperless — Eliminate the need to handwrite documentation and you’ll not only save paper and printing costs, but also save time by no longer needing to walk between the vehicle and the printer. Save Time — You can save an estimated 10 to 15 minutes per customer through the quick VIN and license plate decoding features that instantly decode and record all vehicle-specific data (make, model, engine type, service history, account details, etc.) with the press of a button. Save More Time — Customizable multi-point inspections allow you to build an inspection for your most common jobs and then use these prebuilt inspections over and over. Engage Customers — Take vehicle condition photos and text or email them directly to customers from the tablet. You can reach your customers faster and speed up the approval process. Build Customer Confidence — Digital multi-point inspections demonstrate your professionalism and make a good impression on your customers, which can lead to quicker approvals of higher-ticket services and repairs. Work Remotely — Access scheduling, text message reminders, customized reports, and the other features in the Manager SE and Pro Pack suite of software solutions. Stay Connected — Team Chat (instant messaging) lets you to connect to anyone in the shop.